1899 PC 2 Kreuzer, Mi.P3 with additional-printing "Chorvatské singing association Trebevič", CDS MP Sarajevo 15/6 99. Superb. 1906 postcard sent from Bosenského Brod / K.u.K railway mail II/ 13.IX.06 to Kralovske Vinohrady., handwritten note. "Without statement further address undelivered." Returned back. Nice view of Sarajevo. good condition. 1906 postcard sent from Sarajevo 26/7 26 to Vienna, returned back with mounted sheetlet Bestell - Notizzettel franked with. stamp. 5h, Mi.13, slightly yellowy teeth. Very nice view of town. good condition. 1907 postcard sent from Sarajevo 29/7 07 to Villachu as poste restante, by hand written note. + label Nicht behoben / Non réclamé, sent back franked with. stamp. 5h Landscape, Mi.32. Nice view muslimek in the street Sarajevo. good condition. 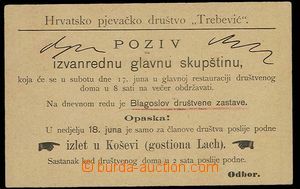 1907 postcard sent from Sarajevo 8/6 07 to Budapest, redirected, CDS Budapest + other, mounted label Insuffisance d adresse, sent back franked with. stamp. 5h Landscape, Mi.32. Nice view of town. good condition. 1908 postcard sent from Sarajevo 20/8 08 to Vienna, redirected CDS Bozen 23.VIII.08 and returned back. Supplemented with cancel. Aufgeber unbekant and unbeheben Zurück (Return). franked with. stamp. 5h Landscape, Mi.32. good condition. 1849 pre-philatelic Reg letter with straight line postmark BISENZ / 15.Dzb. + cancel. REGISTERED, catalogue Votoček. 142/1. 30 pt. good condition. 1852 2 pcs of folded Ex offo letters with straight line postmark M:BUDWITZ / 22 SEP and 21 JUL. 1x very nice print. 1867 folded ex officio letter with blue round cancel. JASSY 14/2 (Jasina - Carpathian Ruthenia). Archiving fold outside cancel., very nice print. 1850 comp. 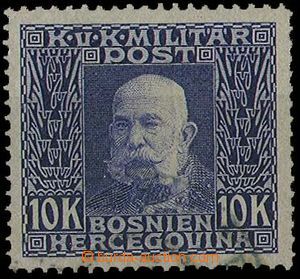 3 pcs of stamp. issue I with various printing errors/flaws - 3 Kreuzer + 9 Kreuzer partial print, 3 Kreuzer dark print emblem / symbol. 1850 comp. 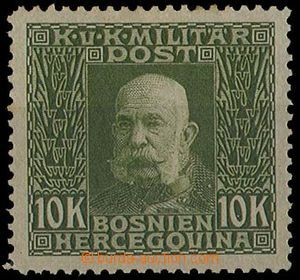 9 pcs of stamp. issue I, 3 + 6 Kreuzer, various varieties and forces paper. Tenký, silky, quadrilled (Quadrillé p.) 2x, HP + MP. 1854 issue I 3 Kreuzer, machine. paper type Ib, gravur 1-2. CDS KRAINBURG / 27.Mai.